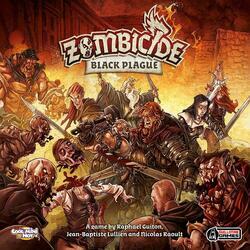 Zombicide: Black Plague is a Cooperative Game. Each player is a survivor with special skills. Zombies are managed by rules: they are directed to sight and noise. Players will have to cooperate if they want to survive. Together with your friends, form a team of survivors in a fantastic world, master their skills and defeat hordes of infected people! Zombies are controlled by the game using simple cards and rules. Play 10 missions on 10 different plateaus composed from the modular tiles of this box, or create your own scenarios. Find some weapons. Kill zombies. The more zombies you kill, the more powerful you become and the more zombies there are! Zombicide: Black Plague is a cooperative game in which 1 to 6 players compete against hordes of Zombies managed by the game. Each player leads 1 to 6 Survivors of a fantastic medieval world invaded by Zombies. The goal is simple: fulfill the objectives of the Quest, survive and kill as many Zombies as possible! Zombies are slow and predictable, but they are very numerous. Keep an eye on the Abominations and the Necromancers, their "bosses"! Survivors slaughter Zombies with anything they can get their hands on. The more effective your weapons are, the more victims you kill and the more new Zombies are attracted to the carnage! Survivors can exchange equipment and players can discuss tactics to be used. Only through cooperation will you be able to achieve the objectives of each Quest and survive. Killing Zombies is fun in itself, but you will also have to save other Survivors, find food and weapons, discover the secrets of the Necromancers and much more. After playing Zombicide: Black Plague, your game group will become the best team of monster hunters! Zombicide: Invader was funded on the Crowdfunding Kickstarter (See the campaign) platform on the 04 May 2018, the campaign lasted 24 days. 18,486 people helped funded the game, whose the amount requested was $250,000.00. Thanks to these 18,486 people the game could be funded up to $3,352,208.00, ~1,340.88%.